I've got 4 more weeks in the cast...so trying to get caught up on these post I started and never finished. This broccoli soup is so wonderful. I added the shredded cheese after putting the soup in the bowl, then broiled it until it was melty, browned and somewhat crispy! You can skip this, and just add the cheese directly to the soup- but then do take it off the heat and serve soon after. If you leave this cooking on the stove then the cheese will burn on the bottom. I've done many versions of broccoli soup- sometimes starting with a more flour cream base; but I do really like this one- as does Dave. He at veggies and he was fat and happy! 3 tbls of butter to 4 tbls of flour mixed to a paste. In the meantime, roast another 2 cups of broccoli (drizzle with a little olive oil) under the broiler. Puree with immersion blender (or drop in the blender - just be careful with the heat). Return to the pot. 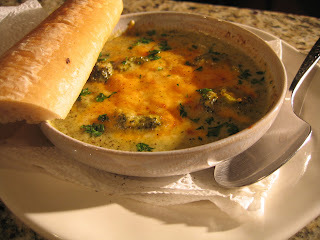 add the broiled bite-sized pieces of broccoli to the soup. Top each bowl of soup with a handful of shredded cheddar and a sprinkling of shredded Parmesan cheese; then broil. 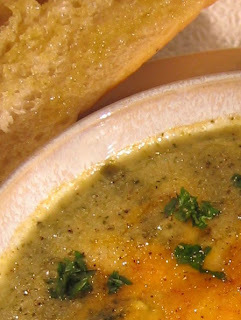 Top with a little fresh parsley and serve with a hunk of crusty bread.